With a rich history once recognized by European explorers such as Cabrillo and early 20th century farmers drawn here by the fertile ground and temperate climate, over time this private enclave shifted from a low-key beach destination to the ideal coastal community for both families and those seeking solitude alike. This relaxed seaside community consists of custom homes with great variety of architectural styles. Founded in 1929, Emerald Bay was named for the color of the nearby waters. With a rich history once recognized by European explorers such as Cabrillo and early 20th century farmers drawn here by the fertile ground and temperate climate, over time this private enclave shifted from a low-key beach destination to the ideal coastal community for both families and those seeking solitude alike. This relaxed seaside community consists of custom homes with great variety of architectural styles. Emerald Bay is located in a dramatic hillside location just North of Laguna Beach and South of Crystal Cove State Park. The community is framed by distinct coastal promontories to the North and South, hillsides to the East and the Pacific Ocean to the West. 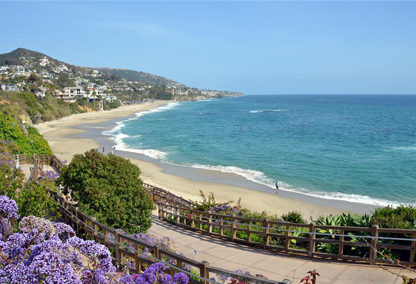 Emerald Bay is located on both sides of Coast Hwy, connected via tunnel below PCH with front row seating to the Pacific ocean on the West side and hillside properties on the East side. Premier properties boast ocean, bay, Catalina Island, canyon, hills and mountain views. Emerald Bay contains 526 custom homes with only 14 beachfront lots surrounded by 14 acres of lush private parks. Private Beach – Emerald Bay boasts an exclusive, residents only private beach, which is approximately ½ mile and staffed with a lifeguard in the summer. Residents have the opportunity to take part in the numerous activities or just relax and take in the views of boats coming in to anchor in the bay. 6 tennis courts, 5 lighted, and a full time tennis pro, instruction programs and tennis pro shop. Swimming pool complex with 25 yard lap pool, diving pool, wading pool and spa. Seasonal and year-round recreational and hobby for all ages are available.